Once upon a time, the dress code of Wigan, owing to its industrial heritage, was mainly work overalls layered in grime and dust. But the town has come a long way since then. With a vibrant culture married to a relaxed lifestyle, you can now see a smattering of cool fashion and hipster style statements. Blessed with a unique, independent spirit, the fashion of Wigan reflects a similar vibe. Shopping options will not disappoint you as they range from the familiar, well-known brands to the more unique. You will find yourself spoilt with choices in terms of styles and offers. A unique benefit that the town offers is a variety in terms of shopping destinations. You can wander into one of the big, glamourous, and comfortable shopping arcades. This would be like a fashion wanderlust, where you roam from one store to another, observing and window shopping, with all the shops located in one convenient location. When you tire of shopping, you can take a break and indulge in some delicious food or some hot coffee. Then you have the more independent markets, kind of like street stalls, where you may be able to find attractive deals and bargains. These stalls may lack the glamour of the more famous brands, but the quality and style of the options are right up there. 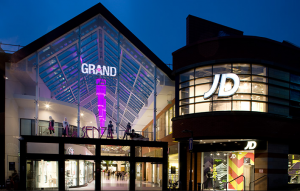 The Grand Arcade is a prime example of a one-stop shop where you can find everything under the sun and more. Located in the heart of the Town Centre, the shopping arcade boasts an impressive architecture that consists of a modern glass façade. Inside you will find a bustling environment where people come for a variety of things. If you have a shopping list that consists not only of clothes but also footwear and other accessories, you will find that the Grand Arcade has got all items covered; right from your head to your toe. You can browse through health and beauty stores, jewellers, and other fashion accessorises. The arcade even has children’s stores that stock colourful, comfortable fashion wear for your kids. When it comes to fashion you can take your pick from brands such as Topshop, H&M, and Hurley, to name a few. 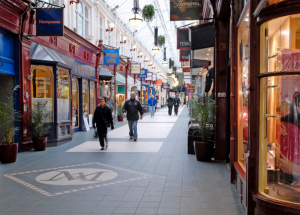 The other big arcade that you will find in Wigan is The Galleries, part of the iconic Makinson Arcade. This shopping centre is more reminiscent of the town’s past, featuring a glorious Victorian architecture. The establishment dates all the way back to the 1890s. The Galleries offers a mix of independent and global brands. If creating a unique style is your thing, then head straight for this arcade. You will find a range of boutique shops that will cater to your hair, your face, and even your nails. If you are looking for some beauty products, you will find them, too. Then there’s something for the intellect, as well, in the form of book stores. The upside of The Galleries is that it gives you a more intimate feel of the town’s culture.